Assalamualaikum everyone. Please see the advert above and message below regarding a series I recorded with Eman channel. You can watch it online via their website. Baarakallahfeekum. Don’t Miss our BRAND NEW show Stories of Al Kahf starting today at 8PM! Stories of Al Kahf delves deeper into the anecdotes and parables from Surah Al Kahf in a really interesting way! 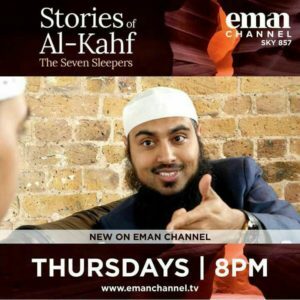 So don’t miss the first episode The Seven Sleepers tonight at 8PM with Sheikh Sajid Umar!